Not all dentists are the same, just like not all GNM dentists are the same. There are dentists who have advanced their education, skills, knowledge, understanding and abilities in other areas beyond the typical forms of general dentistry. These are the dentists who are licensed to practice and abide by their states standards and requirements for safe practice. The practice of these professions is a privilege granted by each State. The Board of Dentistry for each state is responsible for licensure, monitoring and ensuring the safe practice of dentistry for services they render to the people they serve. OC recognizes there are various levels of competency, ability and skill level that must be achieved in dentistry to address the more challenging cases. Qualifications, experience, learning and didactic skills will vary among practitioners treating patients with musculoskeletal dysfunction of the head and neck. OC’s training program acknowledges the need to maintain a high standard of competency and proficiency among OC’s doctors who implement comprehensive gneuromuscular (GNM) care. Levels of courses as well as a clinician’s proficiency in achieving those desired goals is better determined by their up to date continuing education courses taken as well as their experience and training in the 3 disciplines. The patient must realize and understand that not all dentist practice and understand all 3 disciplines. You will need to take responsibility and ask your dental care provider as to what areas of these 3 disciplines is he/she able to provide with competency. Occlusion Connections™ believes in advancing dentist’s technical training and skills above and beyond their peers. OC has various levels of training courses that patients should be aware of. Not all GNM dentist who have attended OC have completed all 8 levels of curriculum. Not all GNM OC dentists have taken all 3 levels of orthodontic/orthopedic training. Not all GNM OC doctors who have attended OC’s training program own a K7 kineseograph. Not all GNM OC dentist practice all 3 disciplines. Those dentist who use a K7 instrument in their practice routinely will be more proficient than those dentist who do not use it has much. Not all GNM trained dentists use K7 routinely since their TMD and occlusal awareness, experience and practice style reflects their understanding. Those dentist who practice all three disciplines will have a more complete understanding and appreciation of your dental problems. Not all OC GNM dentist who have attended all OC courses are proficient. Years of clinical experience and past training does make a difference in one’ appreciation and application of the OC GNM principles. Disclaimer: Occlusion Connections does not “certify” any GNM dentist. Each GNM dentist have different skills, understanding, abilities and knowledge even though they come to OC for learning. OC has 7 levels of occlusion/TMD and bite management courses and we have 3 levels of orthodontic courses. Addition K7 training with their team is highly encouraged. A course in “Scan Interpretation and Clinical Application” is recommended to all OC dentist who have use the K7 kineseograph in their dental practice. (Not all K7 dentist interpret the K7 date in the same way). Each GNM dentist will take a series of courses they feel necessary for themselves. Not all GNM dentists take all 7 levels of OC’s occluson curriculum. Not all GNM dentist who come to OC take all our ortho courses. So not all GNM dentists are the same. Read more: Who Are the GNM Dentists? For those who are searching for technically skilled and able GNM clinicians it is important to recognize the more levels of OC training a dentist has taken, the more likely their knowledge, understanding and skill levels will be in GNM. 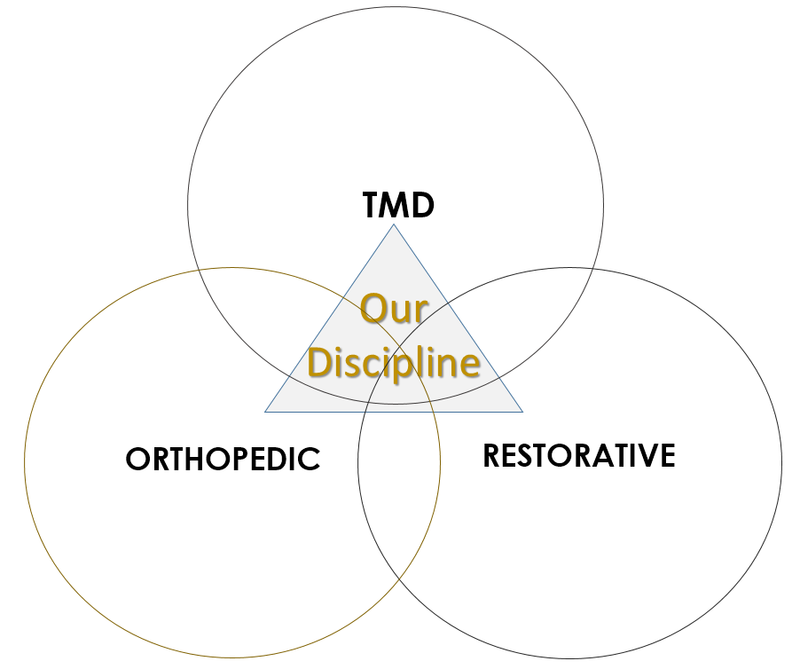 Dentists who have taken all Levels 1-7 courses are designated with this TMD/ Restorative emblem. Dentists who have taken Levels 1-7 course and Ortho 1-2 curriculum and beyond are designated with the OC triad emblem. These designations are given to those clinicians who are more advanced in their understanding of the OC GNM principles and concepts.